We got Nicholas from the Chester County SPCA as a rescue puppy. He was around 5 months old. 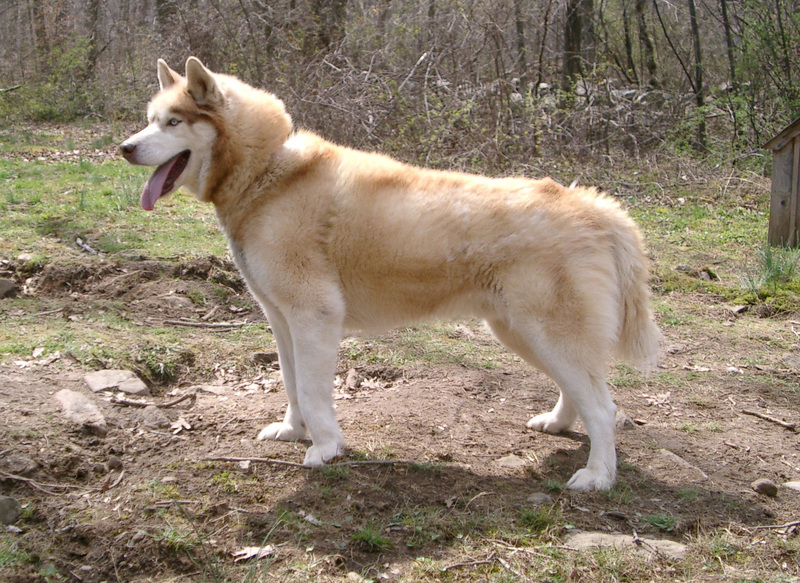 Nicholas was all Siberian Husky. He loved the snow and he loved running. He could run all day and then want to run more. When Nicholas was 5 we had our first baby, Jenna. We wondered what Nicholas would think about our new family member - would he accept her? Not only did he accept her, he instantly took it upon himself to watch out for her. When Jenna cried Nicholas would instantly try to find us and let us know. When Jenna was in reach and was upset, Nicholas would lick her feet to get her to giggle. He loved Jenna as much as we did. He would let Jenna crawl over him and pull his hair (and eyelids) without so much as a sound. In fact, he usually just licked her hands or feet. Nicholas was almost 8 when our second, Cordelia arrived. Once again, Nicholas took charge. He realized that Cordelia would be his best friend almost from day one. When Cordelia was around 1, she would be eating thinly cut salami and would also be feeding Nicholas. She would put her hand, with the salami wrapped around it, into his mouth and pull it back out and just giggle. Nicholas just sat there looking up at Cordelia. He did nothing about the salami being offered to him until Cordelia actually let go of it and let it drop to the ground. Again, Cordelia would giggle. As Cordelia got older, she started to actively offer her feet to Nicholas. Nicholas always loved licking her feet since Cordelia would then giggle and laugh so wonderfully. You could see the joy in his eyes. Nicholas was key to helping the girls adjust to our move to Duvall, Washington. 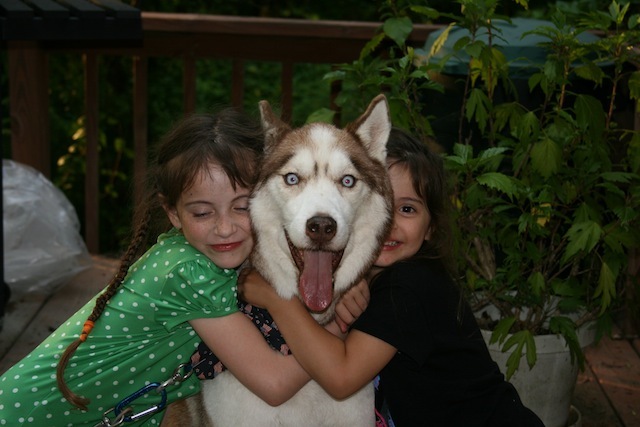 He did not like the trip in the airplane but he loved being with the girls. A bit over a year ago, we got a new puppy, Blue, and Nicholas was a great step-father and mentor to Blue. He was very careful with the puppy and allowed the puppy to play and pull on him without complaint. 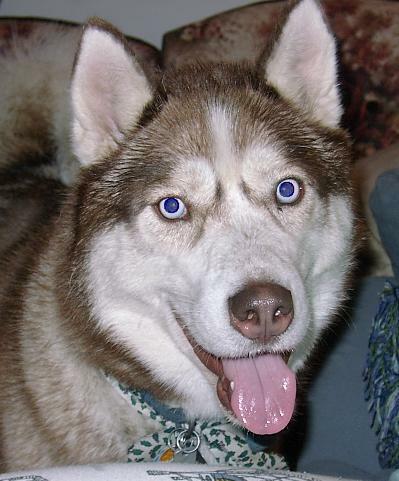 (So much so that Blue destroyed Nicholas's collar.) But we already knew that Nicholas was getting old. He was starting to slow down. He still ran around but there were times he just did not go as fast or as long as he used to. Nicholas had a great life and touched all of us with his amazing kindness and affection. We could not have asked for a better friend and caregiver for our girls, or for us. 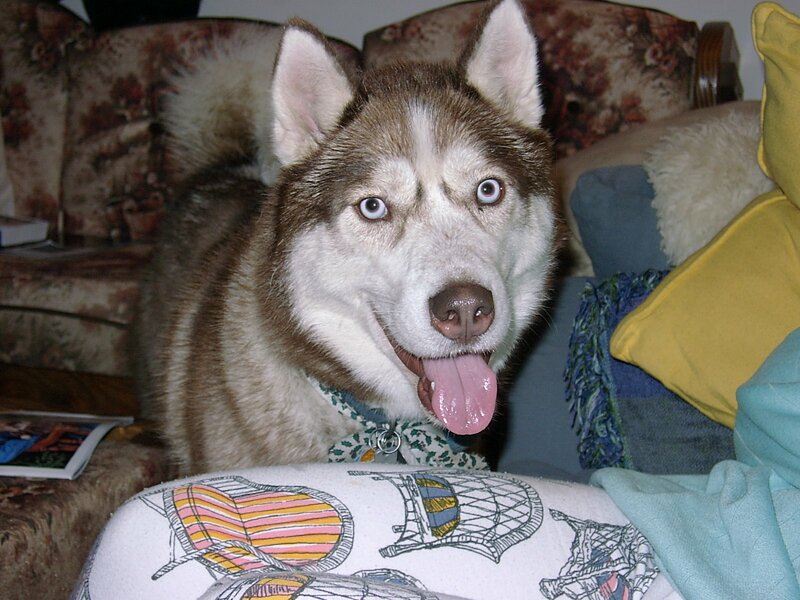 It was very hard to let him go but on March 28th, 2011, Nicholas took the long walk across the Rainbow Bridge. We will miss him more than we could ever express and hope that he is enjoying long runs in the snow without the pain of old age or arthritis. There are soft pastures for Aussies and Border Collies, with sheep and geese to pen. Agility equipment grows like trees amid Frisbees and flyballs.